The school has a reputation for its religious education, solid academic curriculum, strong discipline and a safe family environment. “In addition to a challenging course load, our students learn integrity, the love of service, sharing and mutual respect,” said Yvonne-Therese Russell-Smith, principal of the academy. The eighth-grade class received scholarships from the most prestigious high schools in New York, including The Mary Louis Academy, Christ the King High School, St. John’s Prep, Cathedral High School, Cristo Rey New York High School and St. Francis Prep High School. “We’re very grateful to have a school of this caliber in Southeast Queens,” said Marie Faustin whose daughter, a graduate, was accepted at St. Francis Prep. 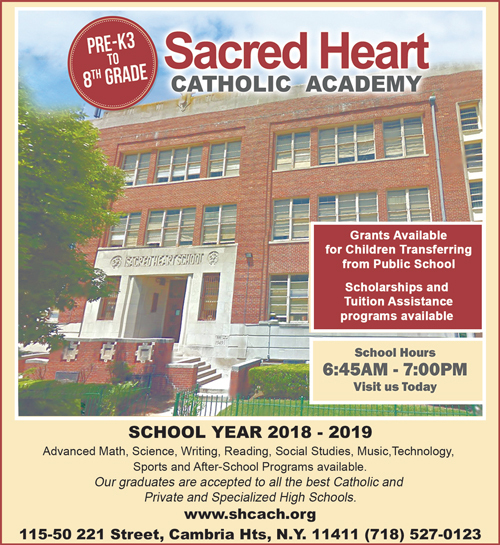 Sacred Heart Catholic Academy and the Catholic high schools in New York City have a graduation rate of 99 percent. Grants are available for qualified families. For information, call 718- 527-0123. The school is open 7 a.m. to 6:30 p.m. I would like to know if this School had the same address at 221 St Cambria Hts in 1949, I believe my brother Raul and I went here for 3 years and Nuns gave us class. We did like the school very much and still remember it, think you keep doing wonderfull job.